Schools from across the West Midlands and the South East are being asked to take part in a government programme designed to help teachers return to the classroom after a career break, the School Standards Minister Nick Gibb has announced today [14 March]. Together with schools in these areas, the Department for Education will test the best approach to supporting teachers who have taken time out of their careers, providing funding to help them after they return to the classroom. It’s part of the drive to help schools attract and keep the best and brightest people working in their classrooms, and follows the Education Secretary’s recent announcement of a strategy to drive recruitment and boost retention of teachers. The pilots, which will start in May, will build on existing evidence and help teachers re-acclimatise to the classroom and support continuous professional development through a range of measures, including funding for National Professional Qualifications. Thanks to a hardworking and incredibly talented generation of teachers, alongside the government’s bold reforms, there are now 1.9 million more children in good or outstanding schools than in 2010. "There are a record number of teachers in our classrooms – 15,500 more than in 2010 – but we want to build on that. Many of us will need to take time out from our careers at some point, and teaching is no different – but it can be hard to return to the classroom. "We want to support teachers by giving them more options on how to return to the workplace. As well as helping to keep experienced and valued teachers working in our schools, this pilot will help make sure teaching remains attractive to the next generation and regarded as a profession that is flexible to the demands of the modern world." Once the lead schools are confirmed the pilot itself will be launched later in the year, with the recruitment of the returning teachers due to take place in the summer term. The pilot has a budget of £298,000, which will be adjusted depending on the number of returning teachers supported by the lead schools. 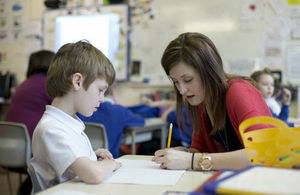 Up to 10 lead schools are being sought across the two regions to deliver the pilot. • developing a free website for schools to publish vacancies to help reduce costs and make it easier for aspiring and current teachers to find new posts. Last summer, the Government Equalities Office announced a broader £5million package of support for those returning to or wanting to work in the public sector after career breaks.